CATEX is a global and professional provider of crypto currency exchanges. CATEX crypto-currency exchanges provide prizes and dividends to CATT token holders where many other crypto currency exchange projects have been adopted this same approach and method but in their own case their motive is to gain volume and gain popularity as in crypto space . The CATEX project is one of the real exchange projects I’ve seen, all trading platforms are filled with active crypto currency traders. Some other exchanges of crypto-currencies out there have been reported to have adopted the use of trading bots in other ways to increase the volume of trading exchages where these are bubby traps for ICOs and real projects that might want to register on crypto-currency exchanges. This is one reason why some crypto currency exchanges fail to achieve their goals and objectives. The use of blockchain technology has evolved to the extent that any form of manipulation will be detected in the blockchain network simply because of the high transparency known to blockchain technology. Today despite the uncertainty facing the crypto currency and the problems facing the crypto currency trading platform, CATEX stands on their feet and this has made them one of the best crypto currencies that survived the test of time. Another thing that I want to pay attention to from every crypto-currency trader is the application of several trade and exchange features (low trading costs, fast deposits and withdrawals, 24/7 support, transparency and trust, high security) in CATEX platform exchanges. If I have to start mentioning them, you will find these features not a new feature in crypto currency exchanges, even some other crypto currencies have the same features as CATEX but the fact is that there is no exchange with this feature that really shipped according to the features listed in the exchange and their road map. Every time I try to read the features of some exchange projects, I always shake my head just because the majesty of the newly launched exchange project doesn’t even know what is needed to run the exchange successfully. We have seen many promises from exchange projects, some of the newly launched crypto exchanges can even promise to move mountains with their simple hands so that they become popular and known in the crypto space. But the real question remains, how many of them really fulfill their promises to traders and investors. I have personally invested in a different crypto currency exchange project where I was disappointed until I discovered the exchange of CATEX crypto currency. When we look at the point of the world as a result of technological developments, we see that different types of money are used to make payments. Especially in recent years, instead of using physical money, credit cards and new crypto coins are used. Crypto coins are digital exchange tools developed by the digital environment, produced by high performance computers and software professionals, which can be transferred and used without the need for central bank or other intermediary institutions. Crypto coins today are crypto exchanges where we can convert to other crypto coins or fiat currencies. Crypto money exchanges are many trading platforms that bring us a lot of convenience, but also bring with them a number of problems. Since the day they were established, some negative news such as security breaches and stolen accounts have begun to be heard on crypto money exchanges. This negative situation, of course, increases in parallel with the increase in the number of users. However, in many stock exchanges, high commission fees, security weaknesses, useless menus, weak graphics, low transaction rates, problems with deposit and withdrawal transactions, irrelevant customer service, lack of contact with problem users, excessive density in the stock market and continuous maintenance Problems such as sites, users are the most common annoying conditions. The Catex platform is a user-friendly trading platform that was established in August 2018 with the aim of eliminating all the problems and problems experienced by users. The Catex platform is one of the best examples of the crypto exchange exchanges in the block chain field. 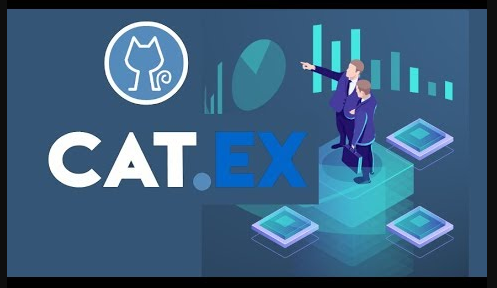 The Catex Exchange has initiated a transformation that returns the commissions that were cut off when users made a trade, returning them as Catt coins to the user with certain bonuses. In this way, 80% of the commissions are distributed to the users who have Catt coins by their rate of transaction or by the rate of Catt coins they hold. 7 – 15 – 30 and 60-day periods Catt coin holding or lock-in (Dividend) Catex stock market revenue earned from the share and Catt coin bonus is given. The percentage of the Dividend earnings table with the locking of the Catt coin is shown in the table below. All important decisions on the Catex stock exchange are presented to the current user community and received based on the comments from them. Catex management will only be responsible for major operations related to the platform, marketing operations and some important managerial issues. As can be seen, the Catex platform differs from many crypto money exchanges, both in management, in earnings and in use. One of the most important earning methods on the Catex stock exchange is the opportunity to earn money through mining activities. How is mining done and in what proportions? Mining earnings have certain criteria. The most important is the Mining rate. The mining ratio is a value defined by the platform to physically control the mining provision. It is the level of difficulty that is re-adjusted every day in order to maintain the gain stability of the mining companies, which are similar to the blocks we know from other mining coins. After logging in to your personal account on the Catex Stock Exchange, you can see your personal mine rate. Finally, the Catex stock exchange lists 2 tokens per week, free of charge by users’ vote. In many respects, Catex has differentiated its competitors and makes a difference in token listing. When we look at the developer team of the Catex platform, we can say that the team consists of experienced people who can express themselves well. The people in this team have shown that their vision is broad and far-sighted. That is why they deserve praise. 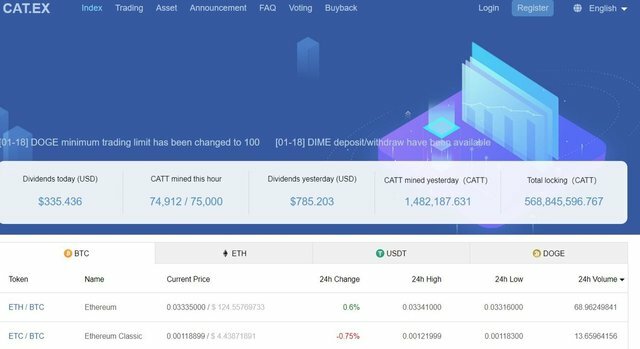 For traders who want to trade on the Catex stock exchange or invest in Catt coins, Catt sales are currently available on the Catex stock exchange. You can easily register on the stock market and invest. Thanks to the different features it provides, we can say that many users will be interested in Catex stock exchange which will make their investment life easier and the future is very bright. But these views are my personal opinions and only connects me. I would ask you to act with your free will and not to consider the information given here as investment advice that will give you a definite gain. DIVIDEND FEATURES – This is a very good crypto-currency exchange feature but this feature is best used on the CATEX trading platform. CATEX distributes 80% of its daily commissions to CATT token holders. Some other exchanges provide 30% profit for their token holders. This approach has helped reduce the disposal of original tokens on CATEX exchanges unlike what was experienced during the exchange of other crypto currencies. With an 80% dividend payment, investors are encouraged to hold their tokens. TOKEN LIMITED IN CIRCULATION – This has been another big step taken by the team to ensure the CATEX project is successful. It has been observed that other crypto currency projects with large amounts of circulation are always struggling to survive only because high circulation is always producing low value tokens. CATEX’s total supply is 10 billion and only has 2 billion in circulation which is a good approach to ensure there is an increase in the value of a stable token. Transparency and Trust are other important features of CATEX exchanges. With the adoption of blockchain technology, CATEX trading activities can be easily tracked on the blockchain network.